This year's fruit picking has finished. Welcome to Yamagata Cherry Land and Kaminoyama Tourism Fruit Garden! We are a fruit farm in Kaminoyama City in Yamagata where visitors can experience fruit picking,tasting and shopping. Please try a fruit picking course so that you can eat and bring back home all fruits you pick here. 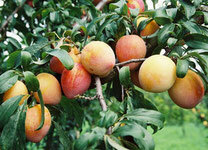 Fruit picking is available from June to November. Cherries 9th Jun. to 20th Jul. 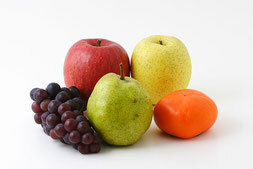 Japanese Pears 5th Sep. to 15th Oct.
Grapes 1st Sep. to 31st Oct. Apples 10th Sep. to 30th Nov.
1. 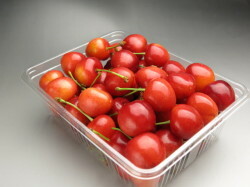 We have developed cherries called "Taisyo-Nishiki". Taisyo-Nishiki is bigger than a common American cherry. The flesh is thick and chewy and has rich sweetness. 2. 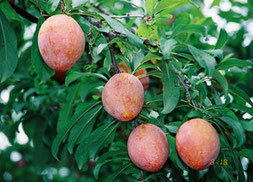 Our farm produces Japanese plums called "Gekko" at the largest amount in Japan. Visitors can pick Gekko only at our farm in japan. Gekko(月光), meaning moonlight,whose yellow flesh looks like beautiful moonlight, tastes juicy and very sweet. 3. Our farm serves the fruit picking course where you can pick grapes called "Shine Muscat", which makes our farm different from other fruit farms in Japan. Shine Muscat has big flesh and elegant sweetness with rich perfume. ・No need for reservation - you can just join a course *If you are a group of more than 15 people, Please call us before you come to our farm. ・We can accept visitors for cherry picking from June 9th to July 20th. No closed day during this period. We have a green house which enables you to enjoy cherry picking even on a rainy day. ・Time: All-you-can-eat for 1 hour. ・Fee: Children aged over 7 and adults, \1,200 Children aged 3 to 6, \300 Children under 3 are admitted free of charge. ・If it's possible, Please call us before you come to our farm. ・Reception for plum picking is the same place as cherry picking. ・ No need for reservation - you can just join a course. ・We can accept visitors for grape picking & autumn fruit picking from the beginning of September to the end of October. No closed day during this period. 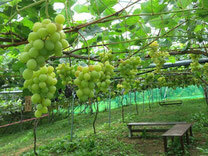 We have a green house which enables you to enjoy grape picking even on a rainy day.